END UNIT!! 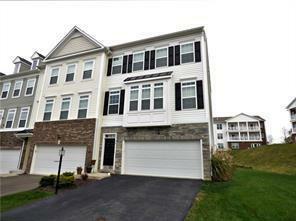 3 Yr. Old Luxury Townhouse in a desirable neighborhood. GREAT LOCATION- Very close to I79 and I376 and the Pgh. International Airport. This home boasts 3 Bedrooms/3.5 Baths, and a 2 Car Garage on a large lot. Many noteworthy Upgrades were chosen at time of build, which include: PREMIUM LOT, END UNIT, 4 FT. EXTENSION ON THE BACK OF ALL 3 LEVELS, HARDWOOD FLOORING ON MAIN LEVEL, OPEN OAK STAIRS WITH IRON BALUSTERS, UPGRADED CARPET AND CERAMIC TILE FLOORS, FINISHED WALK-OUT BASEMENT WITH FULL BATH, CROWN MOULDING BOTH FLOORS, WINDOW TRIM PACKAGE, UPGRADED KITCHEN CABINETS, GRANITE COUNTERS, WHIRLPOOL TUB AND MUCH MORE! The Main Level includes the Kitchen, Dining Area, Living Room and Family Room. The Basement has an additional finished room, a Full Bath and a door to the backyard. Spacious Master Bedroom Suite with a Spa-like Bath and Walk-In Closet. 2 other generously sized Bedrooms with a Full Bath. Laundry is conveniently located on the Bedroom Level. Hello, I'm interested in 16 Roosevelt Drive.